Blake Lively, Ed Westwick and Leighton Meester were spotted headed to The Bowery Ballroom in New York City yesterday to shoot some scenes for ‘Gossip Girl’. The girls were trying to hide their swanky attire, but we couldn’t help but notice Leighton’s Red Valentino dress as she made her way to their dressing room trailers. 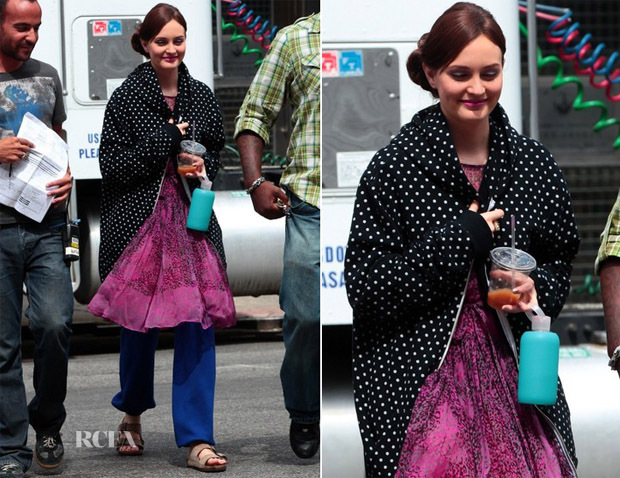 Leighton wore an American Apparel polka-dot hoodie and blue sweat pants with her Red Valentino animal-print silk chiffon dress. As you can see clearly below, the pretty 50s-style dress has a frothy layered skirt, a camisole top lining, and a self tie at the waist. You can buy Leighton’s Red Valentino dress from Net-A-Porter.com.